Tom Delahanty was the spitting image of his celebrated older brother Ed, but smaller and far less gifted athletically. Tom’s major-league playing career was brief, in no way comparable to that of his Hall of Fame sibling. Nor was it a match of the fine 13-year career enjoyed by younger brother Jimmy Delahanty. Indeed, Tom did not even attain the major-league journeyman status of his brothers Joe and Frank. The only kinsman whom Tom managed to outperform was youngest brother Willie, the only ballplaying Delahanty not to reach the majors. The brief nature of his tenure in the bigs notwithstanding, Tom was a competent professional, and he enjoyed several fine seasons in the high minors. Still, Tom Delahanty is remembered today only for the fact that he formed one-fifth of the largest brother combo ever to play major-league baseball. The exact year of Tom’s entry into the pro ranks is uncertain. The questionnaire completed on behalf of his late brother by Frank Delahanty in 1964 states that Tom’s first year in professional baseball was 1893, and there is the oblique press reference to his playing in the Ohio-Michigan League that year.5 But it was the 1894 campaign, whether it was his maiden pro season or not, that stamped Tom as a comer. Playing second base for the runner-up (68-55) Peoria Distillers of the Western Association, Tom batted a solid .297 in 101 games. His 39 extra-base hits included 10 home runs, and he stole 18 bases. Meanwhile, his brother Ed was tearing up the National League, batting .404 and giving the Philadelphia Phillies, with Sam Thompson (.415) and Billy Hamilton (.403), the only all-.400 hitting outfield in major-league history. During the latter part of the season, Ed began to pester club officials about signing his younger brother. Then as the fourth-place Phillies’ season drew to a close, a stabbing injury to his hand incapacitated Bill Hallman, the club’s ornery second baseman. Largely to humor Ed, Philadelphia decided to install Tom Delahanty at second for the season finale in Cleveland. Tom made his major-league debut in his hometown before family, friends, and about 1,500 other spectators on September 29, 1894. He fared decently at the plate, going 1-for-4 (a single) off Cleveland right-hander Mike Sullivan, but muffed one of his eight chances in the field, perhaps a harbinger of the defensive problems that would plague him during his early career years. Playing alongside at third base,6 Ed contributed three errors of his own as the Phillies dropped a sloppily played 11-3 decision. Despite the loss, Tom’s reviews were good.7 And the Delahantys were pleased that another family member had achieved major-leaguer status. Joining a formidable second-place squad that had captured the 1895 postseason Temple Cup, Delahanty was auditioned for the third-base job held by veteran Chippy McGarr. Early reviews were glowing. A wire-service dispatch printed nationwide stated: “Every day the wires from Hot Springs tell the same stories of the remarkable work done at third base by Tom Delahanty.”11 Cleveland newspapers were equally enthusiastic. “In practice games [Delahanty] has been knocking out home runs and covering the bag in a way that makes McGarr tremble,” asserted the Cleveland Leader.12 Even crusty Spiders manager Patsy Tebeau apparently got carried away, declaring that Tom Delahanty “will be the equal of his elder brother” Ed.13 Sadly, once the regular season started, Tom faltered. In 16 early-season contests, he batted a mediocre .232. But the real disappointment was his defense: 11 errors, yielding a dismal .823 fielding average. By late May, the audition was over. McGarr was restored to the lineup, and Tom Delahanty was sold to the Pittsburgh Pirates. Tom’s tenure there consisted of one game in which he went 1-for-3 at the plate and committed an error in four chances at shortstop. He was then sent to Albany/Toronto in the Eastern League where he completed the 1896 season, batting .245, with 40 stolen bases, in 99 games. Tom Delahanty was only 25 years old and would continue playing in Organized Baseball for another nine seasons. But his major-league days were now behind him. Although a member of four different clubs, he had appeared in only 19 big-league games, posting a .239 (16-for-77) batting average. An eight-to-five walks/strikeouts differential raised Delahanty’s on-base average to .329, while five extra-base hits (all doubles) yielded a modest .313 slugging average. He scored 13 runs, drove in 6, and registered 4 stolen bases. Given that he was a middle infielder, such numbers might have afforded him more time in the National League had his fielding been better. But Delahanty’s .805 fielding average (15 errors in 77 chances) was simply unacceptable. Although his defensive play would improve over time, Tom would not get another chance at major-league ball. Tom returned to Newark for the 1898 season, but was released in early May. With his career headed in the wrong direction, his playing days appeared numbered. Enter Bill Sharsig, one-time founder and manager of the Philadelphia Athletics of the major-league American Association, and now impresario of a rival Atlantic League franchise, the Allentown Peanuts. Sharsig thought that a brothers act might prove a gate attraction. To that end he signed Tom Delahanty, and thereafter his younger brothers Jimmy and Joe, both recent graduates of the Cleveland sandlots playing minor-league ball elsewhere. At times the Peanuts would feature an infield with Tom at second base, Jimmy at shortstop, and Joe at third [although Joe more often played the outfield]. The club was not overly successful, finishing 55-67, but playing in Allentown revived Tom’s career. In 118 Atlantic League games combined, he batted .288 and his fielding improved, as he recorded a .925 FA at second base.17 When a hoped-for call-up to a major-league club did not materialize, Tom returned to Allentown for the 1899 season and posted a .333 batting average, but appeared in only 54 games. Delahanty began a third season in Allentown as team captain and manager,18 but the Atlantic League folded on June 12, 1900. Club owner Sharsig then sold Tom’s contract to the Cleveland Lake Shores of the new American (née Western) League, but Delahanty’s stay with his hometown club was brief. After a three-game tryout, he was shipped to the Youngstown [soon to be Marion, Ohio] Glass Blowers of the lower-level Interstate League. The year 1903 would prove an exceedingly difficult one for Tom Delahanty. Being a team manager did not come naturally to Tom. He did not have the outsized personality of Big Ed or the aggressive, often adversarial, disposition of younger brothers Jimmy and Frank. Tom was a quiet, introspective man, and the Grizzlies got off slowly under his charge. Then in early July, tragedy struck. Ed, his life in turmoil, went AWOL from the Washington Senators. Days after his disappearance, Ed’s bloated and lifeless body was found in the waters below Niagara Falls.25 Although they had not seen each other in two years, they had been close, and Ed’s death devastated Tom. Upon receiving the awful news, Tom took a train and hastened east. But the family, distressed by the swirl of attention and concerned about the condition of Ed’s corpse, had the funeral before Tom could reach Cleveland. As noted by Ed Delahanty biographer Jerrold Casway, “Tommy never forgave the family’s decision.”26 And like his brother Frank, he would long suspect that Ed had fallen victim to foul play. Within weeks of his return to Denver, Tom was relieved as field boss of the underperforming (37-42) Grizzlies.27 His replacement was the recently retired Cubs infielder Bobby Lowe, who at the time shared with the late Ed Delahanty the distinction of being the only player to hit four home runs in a major-league game. For the rest of the season, Tom remained a regular in the Denver lineup, primarily playing second base. He again turned in excellent offensive numbers: a .310 batting average, with 82 runs scored and 19 steals in 113 games played. He also played solid defense (.955 FA at second, and a .971 FA in 24 games in the outfield), provided he was not stationed at third base (.898 FA in 10 games).28 But his time in Denver was over. Notwithstanding physical problems, “Poor Tom” appeared in no less than 205 games for Seattle, batting .275 (228-for-829) with 44 extra-base hits.36 But incoming Seattle skipper Russ Hall unloaded Tom that winter, trading him and former major-league star George Van Haltren to Des Moines of the Western League for a nonentity named Miller.37 But neither of the veterans would report to Des Moines, with Delahanty announcing plans to play for Lodi in the outlaw California State League.38 Ultimately, Tom agreed to his transfer to another Western League club, the Colorado Springs Millionaires. As in every place save Seattle, Tom’s arrival was greeted warmly by the Colorado Springs faithful and the local press.39 And when Ed McKean stepped down as Millionaires player-manager, Tom was assigned team captain responsibilities.40 Delahanty still swung a good stick (.304), but age was now taking its toll. He appeared in only 72 of the club’s 144 games, often at the less-demanding position of first base. For the 1906 season, Tom reunited with his brother Joe, playing for the Williamsport (Pennsylvania) Millionaires of the independent Tri-State League. But he had little left, and was released in early June after batting a mere .168 in 27 games.41 Tom’s professional playing career had reached its end. Although only a marginal major leaguer, he had played well at the minor-league level. In over 1,300 games, mostly in the high minors, he had batted a solid .295, with doubles/triples power, and had stolen 321 bases. His nemesis, sadly, had been an unreliable glove. Upon leaving the game, Tom returned home to Cleveland. Never married, he lived in his parents’ home into the mid-1920s, supporting himself as a boilermaker, machinist, and toolmaker. Like his brothers Joe and Willie, he also ran a neighborhood saloon, on and off. Around 1928, Tom left Cleveland, eventually settling in Sanford, Florida, a central-state lake port where he ran a general store and fishing camp for the remainder of his working life. On January 10, 1951, Thomas James Delahanty died at home “following a brief illness.”42 He was 78. Following funeral services, he was buried at All Souls Catholic Cemetery in Sanford. Survivors included his sister Katherine Delahanty Maguire, and his brothers Jimmy, Frank, and Willie. Sources for the biographical detail provided herein include the Tom Delahanty file, with player questionnaire, maintained at the Giamatti Research Center, National Baseball Hall of Fame and Museum, Cooperstown, New York; Jerrold Casway’s definitive biography, Ed Delahanty and the Emerald Age of Baseball (South Bend Indiana: University of Notre Dame Press, 2004); The Encyclopedia of Minor League Baseball, Lloyd Johnson and Miles Wolff, eds. (Durham, North Carolina: Baseball America, Inc., 2nd ed., 1997); Delahanty family tree postings on Ancestry.com, and certain of the newspaper articles cited below. Baseball statistics have been drawn from Baseball-Reference.com, Retrosheet, and The Minor League Register, Lloyd Johnson, ed. (Durham, North Carolina: Baseball America, Inc., 1994). 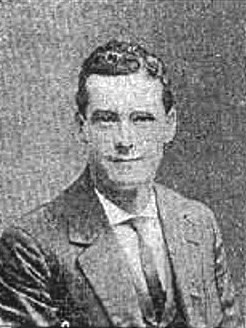 1 The other Delahanty children were Edward (born 1867), Katherine (1874), Joseph (1875), James (1879), Florence (1880), Frank (1882), and William (1885). Two other Delahanty children, a baby girl (name unknown, born 1866) and Martin (1868), did not survive infancy. 2 As per the player questionnaire completed by his younger brother Frank in 1964, and now contained in the Tom Delahanty file at the Giamatti Research Center. 3 Baseball reference works invariably list Tom Delahanty as a left-handed batter. The provenance of this datum was undiscovered by the writer, but wherever it came from, it is wrong. Like his brothers, Tom batted righty, as irrefutably established by published photos showing him in his batting stance. See the Denver Rocky Mountain News, June 8, 1902, and the Washington Evening Star, June 6, 1907. The player questionnaire completed by his brother Frank also designated Tom Delahanty a righty batter. 4 Tom’s physical resemblance to his older brother would be noted throughout his career. See, e.g., the Cleveland Plain Dealer, April 20, 1896, and Sporting Life, November 13, 1904. Years later, Clark Griffith recalled that all the Delahanty brothers looked alike, and that there were “about 73 of them.” See Mike Sowell, July 2, 1903: The Mysterious Death of Hall-of-Famer Big Ed Delahanty (New York: Macmillan, 1992), 116. 6 During the 1894 season, the Phillies periodically stationed Ed in the infield in order to get the bat of outfielder Tuck Turner (.418 in 347 at-bats) into the lineup, as well. 7 A wire-service report stated: “Tom Delahanty, a brother of Ed, played second in Hallman’s place and proved himself a promising youngster.” See New York Herald-Tribune and Springfield (Massachusetts) Republican, September 30, 1894. 8 As per Sporting Life, February 16, 1895. 9 Sporting Life, August 17, 1895. 10 As reported in the Covington (Kentucky) Post, October 2, 1895. 11 See, e.g., the Boston Daily Advertiser and Jackson (Michigan) Star, April 2, 1896. 12 Cleveland Leader, April 20, 1896. 13 According to the Chicago Daily Inter-Ocean, April 19, 1896. At the time Ed Delahanty, coming off his second consecutive .400-plus season, was arguably the best hitter in all baseball. 14 Delahanty played 12 early-season games in Milwaukee, was released, and then joined Kansas City, as noted in the Kansas City Star, May 11, 1897. Six weeks later, Kansas City released “second baseman Tom Delehanty for dissipation,” according to Sporting Life, June 26, 1897. Alcohol abuse was rife in the Delahanty family, with bothers Ed and Jimmy having notably serious drinking problems. But the June 1897 Sporting Life item is the only reference to Tom being a drinker found by the writer. 15 In noting Delahanty’s release by Louisville, a sympathetic newspaper account suggested that damaged hands had betrayed him: “Tom has a collection of gnarled fingers now that would stretch a pair of No. 11 white kids [i.e., gloves] out of shape.” Cincinnati Post, July 2, 1897. 16 Delahanty’s various minor-league engagements during the 1897 season are traced in an unidentified March 1900 news item contained in his player file at the Giamatti Research Library. The formal photo of Tom Delehanty that accompanies this bio was published with that item. The Delehanty spelling of the family surname was a variant commonly seen in newsprint until 1911, when brother Jimmy complained about it. “It’s Delahanty, not Delehanty,” he informed the press, adding that “there is nothing quite so annoying as having one’s name repeatedly spelled wrong.” Sporting Life, January 28, 1911. 17 Unless otherwise noted, the minor-league batting stats for Tom Delahanty provided herein have been taken from The Minor League Register. Fielding averages for the 1898 Atlantic League season were published in the Washington Evening Star, November 28, 1898. 18 According to the New Orleans Times-Picayune, May 7, 1901. 19 As per the Boston Herald, April 19, 1901. Ironically, Joe Delahanty was signed to take Tom’s spot on the Montreal roster. 20 As reported in the Saginaw (Michigan) News, May 16, 1901. 21 As per the Denver Daily News, August 18, 1901. 22 See “Captain Tom Delahanty of the Denver Team,” Denver Rocky Mountain News, June 8, 1902. This near full-page article includes five photographs of Delahanty in uniform, including one depicting him in his righty batting stance. 23 Sporting Life, July 18, 1903. 24 As reported in the Denver Post, January 24, 1903, Colorado Springs Gazette, January 25, 1903, and elsewhere. 25 For a comprehensive account of the events that preceded Ed’s demise, see Sowell, 255-280. 26 Jerrold Casway, Ed Delahanty and the Emerald Age of Baseball (South Bend, Indiana: University of Notre Dame Press, 2004), 288. 27 As per the Denver Rocky Mountain News, July 27, 1903. Reportedly, Delahanty was removed as manager at his own request. 28 Neither Baseball-Reference nor The Minor League Register provides defensive stats for the 1903 Denver season. The above fielding numbers for Tom Delahanty were published in the 1904 Reach Guide, 231. 29 See the Augusta (Georgia) Chronicle, December 14, 1903. 30 According to the Boston Herald, March 7, 1904. 31 Waspish commentary on Siwashes players – particularly those, like Tom Delahanty, not hailing from the West Coast – was a staple of the Seattle Daily Times sports page. Even Delahanty’s good looks were the subject of scorn, as the newspaper was given to sneering about “handsome Tom Delahanty, the matinee idol.” See, e.g., the Seattle Daily Times, September 24, 1904. 32 As later repeated in the Seattle Daily Times, March 5, 1905. 33 Seattle Daily Times, January 28, 1906. 34 See, e.g., the Denver Post and Galveston News, August 24, 1904. See also the Dallas Morning News, September 10, 1904. 35 The newspaper chided Wilson for not letting McGraw have Delahanty: “For heaven’s sake, Parke, brace up! If you ever get another chance to get real honest money for Thomas don’t let it go by the boards.” Seattle Daily Times, September 18, 1904. 36 As per Baseball-Reference. The Minor League Register puts Delahanty’s 1904 Seattle numbers at .276 (229-for-830), with 47 extra-base hits and 36 stolen bases, in 194 games. 37 As reported with satisfaction in the Seattle Daily Times, January 12, 1905. The contract offered Delahanty by Des Moines for the 1905 season was reportedly only half what he had made in 1904. See Sporting Life, March 11, 1905. 38 As per the San Jose Mercury News, March 26, 1905, and Seattle Daily Times, March 28, 1905. 39 See “Delehanty Will Be Welcomed,” Denver Rocky Mountain News, April 27, 1905. 40 As reported in the Seattle Daily Times, June 8, 1905. 41 As reported in the Harrisburg (Pennsylvania) Patriot, June 8, 1906. 42 As per Bill Lee, The Baseball Necrology (Jefferson, North Carolina: McFarland, 2003), 99.